White willow is a deciduous tree commonly found along riverbanks and moist woodland settings in eastern North America, England, North Africa and some parts of Asia. Also known as Cricket Bat Willow, Basket Willow and Crack Willow, the tree provides dramatic flair in the landscape with its long and graceful, sweeping branches that sway with the wind. 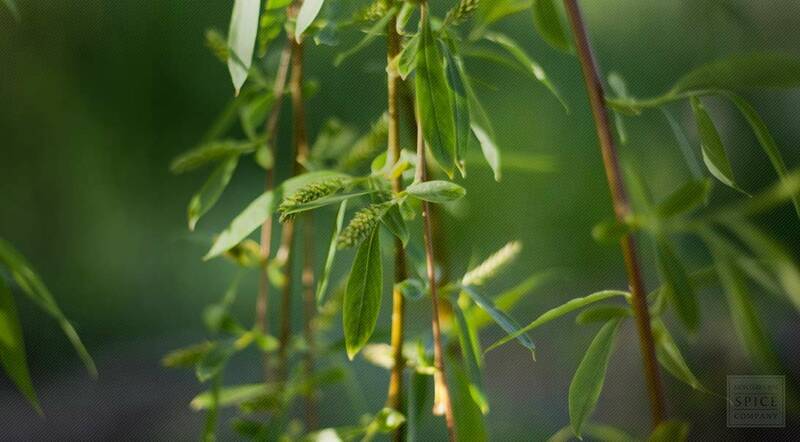 White willow bark is well known as a natural source of salicylates, agents collectively serving as the forerunner of aspirin. Salix alba is a medium-sized to large deciduous tree of the Saliaceae family. This fast-growing (although relatively short-lived) tree it grows up to 10–30 m tall, with a trunk up to 1 m diameter. Its irregular crown is often leaning. The bark is grey-brown, and in older trees is deeply fissured; its shoots are usually grey-brown to green-brown. White willow leaves are covered with very fine silky white hairs—particularly true for the leaves' undersides— making this tree paler in hue than most other willows. The leaves are 5–10 cm long and 0.5–1.5 cm wide. In the early spring, the tree's flowers are produced in catkins (flowering spikes, typically downy and pendulous) in and are then pollinated by insects. The tree is dioecious, with male and female catkins on separate trees. Male catkins are 4–5 cm long; and the slightly shorter female catkins 3–4 cm long at pollination, though they will lengthen as the fruit matures. In midsummer when mature, the female catkins comprise numerous small (4 mm) capsules. Each of these capsules containing numerous minute seeds which are in turn embedded in white down, which aids wind dispersal. 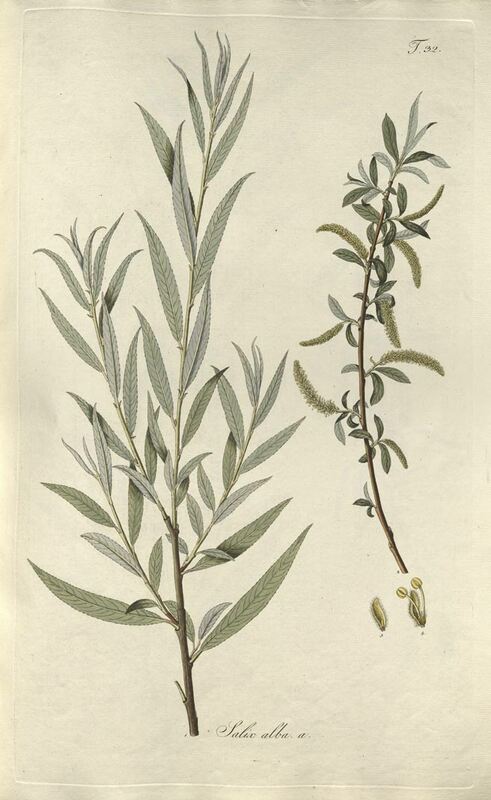 As mentioned above, this willow is paler than others, due to the white tone of the underside of its leaves lent by the silky white hairs that present themselves there. The common name of white willow references this paleness. Salix alba is a species of willow native to Europe and western and central Asia. White willow grows along sunny streams and rivers, marshes, woods and other wet areas. The plant succeeds in most soils—including wet, ill-drained or intermittently flooded soils. However, it prefers a damp, heavy soil. The white willow seed has a very short viability, perhaps as little as a few days, and it must be surface sown as soon as it is ripe in late spring. Can also take cuttings of mature wood of the current year's growth, plant in November to February in a sheltered outdoor bed. Can also be planted straight into their permanent location. White willow bark is harvested in the spring or early autumn. The bark is collected from branches 3-6 years in age, and is dried for later use. Store dried white willow bark, cut pieces and dried white willow bark, powder in an airtight container in a cool, dry place.